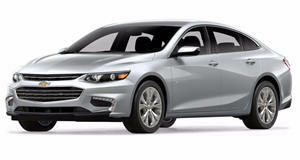 Chevrolet has used this year&apos;s Shanghai Motor Show to debut the all-new Chevrolet Malibu. The relevance of this car to the brand couldn&apos;t be more important, so it was vital to improve on the outgoing model and build an even better one. The new Malibu is built on an updated version of GM&apos;s Epsilon platform and comes standard with an all-new 2.5-liter Ecotec four-cylinder with direct fuel injection, and variable intake and exhaust valve timing. Exact numbers haven&apos;t been released, but we&apos;re told to expect around 190 hp and 180 lb-ft of torque. The upgraded engine will most likely be the Buick Regal&apos;s turbocharged 2.0-liter Ecotec that produces 220 hp. No V6 engine will be offered. A six-speed transmission is also standard. The most notable changes, however, are the interior and exterior. The latter is a clear evolution of the current model&apos;s styling, but with a more prominent grille, a creased hood, projector headlights, and Camaro-like LED taillights. Chevrolet put a huge emphasis on the new interior with high-quality materials throughout. A color touch screen, which contains the radio controls, hinges up to reveal a six-inch deep storage bin. Other options include navigation, lane-departure and forward-collision warning systems, and a rear-view camera.